Markets are up: "Dow unofficially closes up 4.72 percent, or 489.35 points; S&P500 rises 5.44 percent; Nasdaq climbs 4.97 percent". Never mind. The sky is bound to collapse tomorrow. We are all getting a little overwrought. So let me say that I do not think we are doomed. Nobody is ever doomed. Things will change and they might get worse. But the world will not collapse and even capitalism will not end, simply because it is the only economic system dynamic enough to produce the kind of lifestyle we are all, and not just our masters in politics, the EU and the media, accustomed to. It is the only economic system dynamic enough to lift people and countries out of poverty. It will not die, no matter what EU Commissars and Guardian journalists might say. Der Spiegel also quotes the egregious Peter Mandelson fulminating about partisan politics in the USA. Well, nobody could accuse our Peter or his colleagues of partisan politics unless the partisanship is of them against the rest of us. For his and everybody's information, about 40 per cent of the Democrats voted against the bail-out Bill and about a third Republicans voted for it. I wonder whether anybody has done any kind of study as to how those Congressmen and women who are coming up for re-election in November voted. The truth is that, no matter what the British, European and much of the North American media tell us, the Bill was not overwelmingly popular. A new poll by the Pew Research Center found weakening public support for the bailout. The September 27-29 survey said Americans only backed the plan by a 45 percent to 38 percent margin. And those despicable American legislators who are so partisan are accountable to their electorate while EU Commissars like Peter Mandelson are not. If one trawls through the American blogosphere, one realizes that there is a great campaign going on across the country of people trying to stop their Representatives from voting this Bill though. People are phoning and e-mailing politicians and that may well have had an effect on the votes (as did Nancy Pelosi's screaming outburst). Parliament has not even been recalled because it is quite clear that they can do nothing without the permission of the EU and the various committees already in existence. Communicating with one's representative on this subject in Britain is a pointless exercise. So when the article says that "Europe is furious at Washington's failure to agree on a bailout plan, calling Congress 'irresponsible'. ", what it really means is "Increasingly, EU leaders feel the answer to financial instability lies in greater international oversight." You bet they feel that. Ever more power to the people who created much of the mess through their regulatory structure has always been a cry of the bureaucrat and, as I have pointed out (she repeats with gritted teeth), those EU leaders do not have to stand up and justify their behaviour to the electorate. Well, some of them might have to and quite soon, too. Chancellor Merkel is up for re-election next year. President Sarkozy is safe at the moment, though his popularity is not of the highest despite the constant appearance of his ultra-glamorous wife. Prime Minister Brown is still the least popular prime minister for many a long year. Somehow or other, they and their acolytes in the media assure us that the answer is to fling large amounts of taxpayers' money at this mess, rescue banks who made egregious mistakes, stupid people who borrowed when they had no idea how they would pay back the loans, and the hides of politicians who have contributed to this mess. Do we actually know that Europeans or, rather British, Germans and people of the Benelux want their taxes to rocket to finance the bail-out packages? Oh well, who cares? They are merely peasants whose job it is to feel gratitude that their betters take such good care of them. Except that even peasants have been known to riot over taxes and there has been the odd revolution or two in European history. Do we know for certain that all businesses are happy with the idea of more government control? But then, we are ruled by people who instinctively hate businessmen and women; we have a media who, with very few exceptions such as the economic journalists of the Times and the two Telegraphs, routinely lambast the most important people in our economy - the City financiers; and we have a public that repeats the ignorant, envious, poisonous rubbish that the politicians and the media feed them. Still, that same public will not like it if the despicable financiers stop bringing in the lolly and taxes go higher and higher to pay for all that "international" regulation. Above all, we are told, partisan decisions are wrong. There must be a consensus in order to save the financial system and the European banks. Of course, a consensus has to agree on somebody's idea and it is just possible that not all parties and politicians agree. What should they do if they think bailing out banks through taxpayers' money and even more oversight from international and transnational organizations will make the situation worse? If they oppose it they are cursed as contemptible partisan politicians; if they go along with it they find themselves supporting activity that they know to be harmful. On the other hand, if they choose the second option they will be praised for taking part in consensus politics. It so happens that the outcome of consensus politics has been displayed once again in Austria this week-end. The governing coalition between the center-left Social Democrats and the conservative People's Party collapsed in July after a shaky 18-month alliance that hit snags over tax reforms and EU policy changes. Two rightist parties — the Freedom Party and the Alliance for the Future of Austria — won a combined 29 percent in Sunday's balloting. Both parties advocate an end to immigration and the expulsion of foreigners and asylum seekers who commit crimes. In contrast, the People's Party and the Social Democrats had their worst showings since World War II. Despite some news of probable far-right vandalism the truth is that the people of Austria have expressed more than anything else their dislike of that cosy consensus they have been fobbed off all this time; the consensus that is being presented to us all and the Americans as being a superior political system. The response to the people's vote was predictable. The President has reappointed the government as caretaken, though this, as Forbes points out, is standard procedure in a country where every government has to be a coalition. More to the point, as Wiener Zeitung reports, the broad left-right coalition that collapsed in July and has been defeated in the election, is being reconstituted under a new leader of the "conservative" People's Party, Josef Pröll. Right. So that's all that vote was about - a new leader for the disliked People's Party. Political analyst David Pfarrhofer said a remake of the centrist coalition would have to show significant differences from the last to convince a public that came to despise it over the past two years. "Above all, the style has to change. There is a lot of discontent. People don't want quarrels, they want a government," he told Austrian radio. The main parties have been hit by voter frustration over their bickering and concern at a looming economic downturn, inflation and immigration -- a mix which allowed the far right to make significant gains. But Pröll's appointment could mark a fresh start for the conservatives. It is, of course, entirely possible that the people of Austria would like the political establishment to listen to what they are saying, which is clear enough. They do not like the ruling coalition and do not want it to govern. But what do they know? They seem dissatisfied with the consensus and that makes them baddies - almost as bad as those terrible partisan politicians in the United States who pay attention (sometimes) to the electorate. As Edward Lucas says in today's Daily Telegraph, that cosy post-War consensus is coming to and end in many European countries and it is not necessarily a bad thing. Consensus is the antithesis of real democracy. UPDATE: It seems that there was a very visible correlation between Representatives whose seats are in danger and the vote against the Bill. While the fall-out from the financial crisis continued to rip through global banking system, the elephant made cameo appearances on the stage at the Conservative Party conference today, led by its keeper, David Cameron. Blinking at its unaccustomed exposure to the light, in its first appearance it was still shrouded in its veils. Then, briefly, it was exposed in all its glory – but so fleetingly that few if any in the hall noticed it. That first appearance needed a highly sophisticated sensor to penetrate the veils, as Cameron in an unscheduled speech referred to the need to "pass legislation to enable the Bank of England to rescue failing banks." That legislation, he said, is ready, it can be brought before Parliament on Monday and we will support it. He was, of course, referring to the Banking Reform Bill, over which shadow chancellor George Osborne and the government have locked horns. Little Georgie on the one hand, has consistently argued for a greater involvement of the Bank of England, even up to yesterday, when he told the conference that, "It's Conservatives who now want to give power to the Bank of England to call time on reckless borrowing." Today, with the elephant by his side, Cameron acknowledged: "We have been arguing with the government over one aspect: who pulls the trigger to start the process of rescuing a bank." We argued, said the man, "that it should be the Bank of England; the government argued that it should be the FSA." Then, deftly chopping off the legs of his shadow chancellor, Cameron declared, "In the end what matters is getting the legislation through quickly and so I can announce today that we are prepared to drop that objection to allow rapid and safe passage of the Bill - and we can return to this issue later." 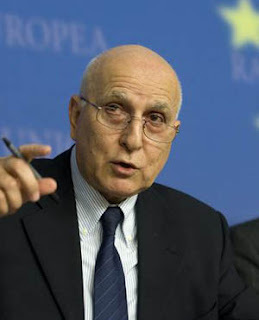 In so doing, he recognised the primacy of the so-called "tripartite system" of regulation, the EU's preferred structure and conceded that he was abandoning attempts to change it. Moving on, the Conservative leader spoke of the need to "pass further legislation to protect people's savings and deposits and ensure quick payout," and thence to breaking "the self-fulfilling cycle that is reducing banks' ability to lend." Thus, he said, as the elephant cast its veils to stand in full view unadorned, "So our regulatory authorities, together with the European regulators, need to address this difficult issue." Cutting through the posturing of the weekend, he has finally doffed his cap to reality, hinting though not baldly stating that the power lies elsewhere. His terse, single sentence was just that – an admission that the UK cannot act unilaterally and must "address" issues "with the European regulators." 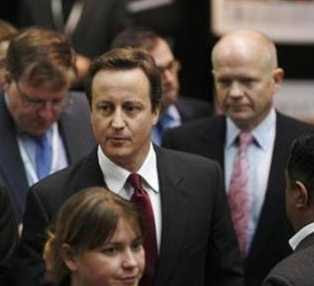 In so doing, Cameron and his merry men – if they ever get to take office – are going to find plenty of competition. Already, the "colleagues" are waking up to the opportunities afforded by another "beneficial crisis" and are muttering about additional regulation - at an EU level of course – to deal with "troubled banks". EU financial services commissioner Charlie McCreevy is happily chirping away – most recently in an interview yesterday with RTE Radio in Dublin – that: "We have been for a long number of years trying to get some kind of European supervisory authority for those institutions that have cross-border reach," adding that, "It is particularly difficult to get agreement among member states who want to preserve control of supervision within their own member states." The "plan" is inevitably couched in terms of "cross-border" institutions but, as the financial services industry becomes more diffuse in its ownership, that virtually encompasses every major bank in Europe. The fact that the Spanish bank Santander has bought UK banks including, Abbey National, Bradford & Bingley and Alliance & Leicester Plc, is but a case in point. The ECB is also flexing its muscles, with Forbes noting that the Commission and those member states with the biggest financial centres - Britain, Germany and Luxembourg - have long resisted any idea of a single European financial regulator. But, it adds, "EU history shows such taboos can be broken in response to crisis." Impinging directly on Cameron's concerns, and ambitions, the commission is therefore considering "giving" home-country authorities greater say "over how much total capital banks must hold to guard against losses," with the EU's Committee of European Banking Supervisors in London mediating disputes between regulators. "The challenge ahead is to maintain this momentum to deliver the full principle of consolidated supervision," says the European Banking Federation in Brussels. The group, we are told, "strongly welcomes the planned amendments" to supervisory arrangements – thus pointing the way for the battles ahead. And, just to underline the increasing dominance of the "elephant" in financial services, we learn via Reuters, that the EU commission has graciously received notification from the British authorities of their rescue package for mortgage lender Bradford & Bingley. "The Commission intends to adopt a decision very, very quickly. I cannot give any comment on the substance of the measures in the plan," spokesman Jonathan Todd said. The "elephant" is very firmly in charge. US lawmakers have "taken leave of their senses" says EU trade commissioner Peter Mandelson. He adds, "I hope that in Europe we will not see politicians and parliamentarians replicating the sort of irresponsibility and political partisanship that we have seen in Washington." 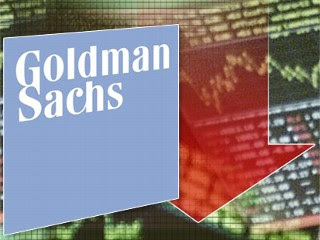 The US stock market gave a more tangible response to the House rejection of the Paulson plan by a vote of 228 to 205. The Dow lost 778 points, its largest point decline ever, and posted its biggest daily percentage slide since the 1987 stock market crash. The benchmark S&P 500 also had its worst day in 21 years. At the time of writing, Forbes was reporting that Japan's Nikkei average was expected to fall, possibly hitting a new low for the year. Bloomberg recorded the response of Thomas Sowanick, who helps oversee $22 billion as chief investment officer at Clearbrook Financial LLC in Princeton, New Jersey. Speaking before the Asian markets had opened, he said, "Something very positive has to come out before tonight's opening or the equities going to get crushed again in overseas trading." His view of the House vote was that the failure to get the bill passed was "disgusting" and "disgraceful." Well, The Guardian is reporting that UK government "was bracing itself last night for further casualties after a day of panic on the world's financial markets." And that appears to have been written before the House vote was known, prompted by fears that the nationalisation of Bradford & Bingley would have a domino effect on the banking sector in Britain. Later comment in The Guardian cites Peter Morici, professor of business at the University of Maryland. He says: "Things are going to get so bad something will have to be done in the next few weeks. Banks will sink, credit markets will seize, the economy will go into something much worse than a recession." Nevertheless, it is too early to say what will happen, but the London stock market in the morning will give us some clue. While others are talking of a "meltdown" and "looking into the abyss," The Times contents itself with saying that this is a "dangerous moment." Me? I go with Morici. We are doomed. But then, what do I know? The US bank bailout has been rejected. Wall Street has nose dived. While all attention here has been focused on the B&B rescue and the drama in Congress over the Paulson plan – to say nothing of Osborne's speech to the Conservative Party conference and, of course, the Fortis rescue – less attention has been given to events in Germany. 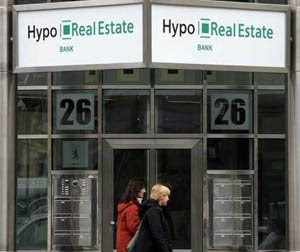 There, according to Deutsche Welle, the German government has been injecting "billions of euros" into troubled commercial property lender Hypo Real Estate (HRE). This, we are told, is the first German blue-chip company to seek a bailout in the global financial crisis. The German Finance Ministry in Berlin is reported to have said it had provided HRE guarantees for an emergency credit line totalling €35 billion (about £25 billion), although there are no plans to nationalise the bank. A spokesman for the finance ministry said the commitment was needed so that [other] banks could bail out HRE. In different times, this might have made front-page news but such is the torrent of financial news that it is hardly surprising that it has been given less than star treatment by the bulk of the UK media. To be fair, The Times has picked it up, together with the news of Glitnir, "the struggling Icelandic bank". This was partially nationalised today as the Icelandic Government bought a 75 percent stake in it for €600 million (£478 million) "to ensure broader market stability". The Icelandic bank move was not unexpected but problems with HRE were not widely signalled. The Times has Bundesbank, and financial regulator, BaFin, confirming that they were involved in the efforts to bail out HRE, and has their spokesman saying: "The Bundesbank and BaFin now assume that Hypo Real Estate Group is secure." On the other hand, Kiri Vijayarajah, an analyst at Citigroup, counters: "Hypo Real Estate also has other problems. It has exceptionally high leverage, which may no longer be viable. Also, we believe it is likely to experience losses on real estate loans, causing more damage to earnings and capital." When blue-chip German banks start feeling the strain, it is time to wonder where it is all going to end. If there was any justice in this world, all you would have to do in the modern equivalent of a music hall is utter two words (or three): "The European Union". You could add, "foreign policy" and that should guarantee to bring the house down. To illustrate the point you could do no better than refer to the latest development in the long-running farce of the EU Chad peace mission which, as we recorded earlier has been dogged by a shortage of helicopters. One can never repeat often enough the details of this farce, where 27 member states, collectively setting themselves up to rival the United States as a "superpower" found it impossible to provide a mere six helicopters to support their humanitarian mission in Chad. And still it goes on. Still unable to resolve the problem, they have hit on what they hope is the ultimate solution, one laden in irony. 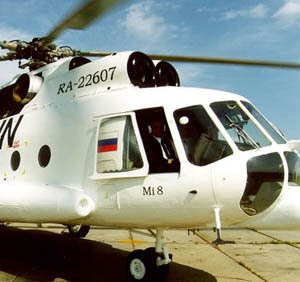 Despite its dispute with Moscow over Georgia, the EU has – according to Reuters - gone cap in hand to the Russians and asked to borrow four of its helicopters. This would boost the number of helicopters available to the EU force by a third – which does not say much for the number already available, to help police an area of operations the size of France. However, Cristina Gallach, a spokeswoman for EU foreign policy chief Javier Solana, is trying to put a brave face on it. She says the Chad mission was "not dependent on the Russian helicopters." Rather, they would "increase its range". 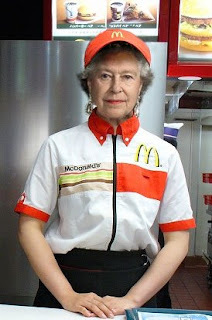 She did concede, though, that the issue "showed the need for the EU to boost its own resources." Perceptive is this one. She should go far. Meanwhile, ministers of the EU member states are planning to do what they do best - talk. They are meeting in Deauville, France to discuss a "longer-term Anglo-French plan" to upgrade Europe's helicopter fleet. And yes, I know Winston Churchill said, "jaw-jaw is better than war-war," but the "colleagues" are turning this into an art form. The BBC website today helpfully publishes the full text of the government statement on the nationalisation of the Bradford & Bingley bank and the sale of parts of the business to Spanish banking giant Santander. It is the Government's current intention to seek state aid approval from the European Commission to extend these guarantee arrangements as part of the restructuring of Bradford & Bingley. The current status of the deal is confirmed by Reuters which reports the EU commission saying it had been in touch with British authorities over a rescue plan, "and expected them to notify the EU executive of state aid in the course of Monday". The agency cites Jonathan Todd, spokesman for EU competition commissioner Neelie Kroes, who states: "We've been in very close touch with the UK authorities throughout the weekend ... Our understanding is that the UK authorities will notify rescue aid to us today." A similar process is in hand with the rescue of the Fortis Bank. The Forbes agency, relying on a Reuters feed, is reporting that EU competition commissioner Neelie Kroes have been consulted on the Fortis rescue and had been "close touch with the Belgian government all weekend." Again Jonathan Todd is cited. He says: "We will look at any state aid involved as a matter of urgency," with the report adding: "Under EU rules, rescue aid must be limited to six months and to the minimum required to ensure the company's survival." That report concludes: "How the EU regulator handles the case will depend on whether the governments buy shares at the market price or inject new capital into the bank." Back in the UK, a merger between Northern Rock and B&B is one of the suggestion being considered as a way of resolving this bit of the financial crisis, although the invisible elephant looms here as well, although you will have to read about it on CNN. More of its role is articulated in local media, rather than the UK nationals, with MEP Martin Callanan saying: "I wouldn't like to see Northern Rock disadvantaged by whatever they do and never forget we are still waiting for the results of the investigation by the European Commission into state aid for Northern Rock." He adds: "And presumably if Bradford and Bingley was rolled into Northern Rock, that would make it even more difficult to win approval. We are already facing huge job cuts in the North East and potentially this could make the situation even worse." Northern Rock itself is already bumping up against restrictions imposed by the invisible elephant. The Times reports that more than £1 billion of savings has flooded into the bank in the past two weeks resulting from the government guarantees underpinning Northern Rock. These have been encouraging savers to move their cash. But, we are also told, "the influx has pushed the bank close to the caps imposed by European competition laws which restrict its ability to compete with the banking industry for customer deposits." 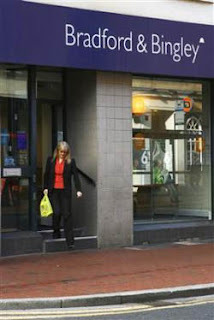 Northern Rock, the paper says, "has agreed" to hold no more than £17.6 billion in customer deposits – equivalent to 1.5 percent of all savings held in British institutions. That is an interesting way of putting it. It is rather like me driving down a motorway with a police car following and my "agreeing" to drive at 70 mph. Anyhow, this has not stopped the Conservatives playing their games, which have developed over the weekend. Wannabe chancellor George Osborne has now declared that he is willing to talk "constructively" with his opposite number Alistair Darling on ways to protect banks and taxpayers. But, he says, B&B's fate was due to the "clear failure" of the regulatory system "established by Gordon Brown." Osborne adds that the Conservatives had proposed a "much better way" of dealing with the crisis, the idea of giving the Bank of England enhanced powers to step in early and run troubled banks while trying to negotiate a private sale of assets. If he wasn't a bit busy, Neelie Kroes's spokesman, Jonathan Todd, might have a thing or two to say about that – in private at least. But Osborne could save him the trouble by reading up EU state aid rules, starting with this short piece. But then, since he seems to believe we are "in Europe but not ruled by Europe," Osborne probably thinks he does not need to read anything at all. On the whole I find economics either very hard to understand or something that is just a matter of common sense. As a consequence, I try not to write about it and this posting will not give you my (somewhat inadequate) opinions on what is going on. Instinctively, I side with those people here and in America who are against the famous bail-out plan, which has undergone some minor restructuring. I am against nationalization of banks and more government interference in business. Politicians, in my opinion, know very little about anything, even politics. They are full of envy of those who do know things and can do them. When they look at people in the City or on Wall Street playing around (as it seems to those in the Westminster bubble or within the Beltway) with billions of pounds or dollars, their hands start itching. Without understanding anything about financial matters they want to move in there and play with those billions themselves. What usually happens is a disaster. 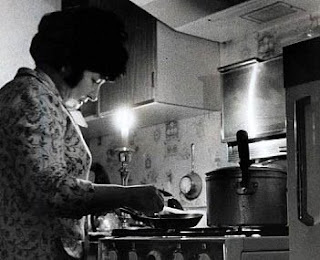 Therefore, I have been quite interested to read ever more references to the Clinton-era Community Reinvestment Act and the pressure that banks and mortgage companies have been under to ensure that people who could not afford to buy their own homes should, nevertheless, be allowed to do so on loans they could never repay. It seems that the people who pushed this insane measures through are largely behind the bail-out now. Interesting. An article on American Thinker gives a good summary; there are links and postings on Michelle Malkin's blog (she is, needless to say, vehemently against the bail-out); numerous references on Instapundit (Glenn Reynolds is less vehement but also sceptical); links and comments on the seriously non-vehement Volokh Conspiracy. Make what you will of it all. Another very clear expose from Roger Kimball. A supposedly right-wing friend railed to me toda about the Bush administration and how it has caused this disaster. I felt very smug when I pointed out that it was Clinton-era legislation that was at the bottom of it. Somehow, I do not think he was going to remember that till the next conversation. Over on the other blog. Gurfinkiel has written an interesting article about a new and potentially dangerous phenomenon on the French left - a more or less trotskyite party, led by a relatively (by the sound of it) charismatic young man, who pretends to be of the working class but is not. At the moment, Olivier Besancenot and his group, the New Anticapitalist party (le Nouveau Parti Anticapitaliste, NPA) are gaining in popularity, at the expense of the tired old Socialist dinosaurs. It could become the dynamic new force on the left or it could split the Socialists and keep them out of power at the centre for many years. One to watch. Here is the article in the Weekly Standard and on Michel Gurfinkiel's website. The story was moving so fast at the time of writing that different newspapers and agencies were telling different stories. 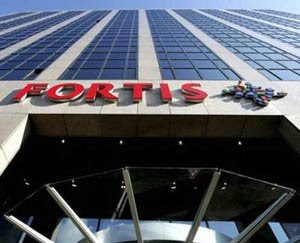 The latest, however, is that the Belgian-Dutch banking and insurance company Fortis is to be partially nationalised, with the governments of Netherlands, Belgium and Luxembourg taking over substantial parts of it. The Dutch government will take over 49 percent of the insurance company, for which it will pay some €4 billion. The Dutch banking division ABN Amro is to be sold. The Belgians will take over 49 percent of the banking division, paying some €4.7 billion and Luxembourg will take over 49 percent of all divisions located on its territory, paying some €2.5 billion. That is the better part of £9 billion, making the Bradford & Bingley rescue - with that bank currently valued at about £290 million – relatively small beer. It is also the first major bank on mainland Europe to fail during this financial crisis, possibly marking a significant new step in the crisis, with European banks having been regarded as relatively insulated from the "credit crunch". What is particularly interesting is the involvement in talks not only of national ministers, such as Wouter Bos, Dutch finance minister, and Nout Wellink, president of the Dutch central bank, but also the close involvement of Jean-Claude Trichet, European Central Bank president, together with Belgium's prime minister, Yves Leterme. The Dutch EUX.TV remarks that the presence of an ECB chief at bank rescue talks is unprecedented and underlines the economic importance of the talks. It is The Financial Times though that puts the crisis in perspective. Belgium, it says, is desperate to prevent a panic because Fortis is the country’s biggest private sector employer and handles the bank accounts and insurance policies of 1.5m Belgian households, or almost half the population. One gets the impression that the "Europeans" have been a little complacent, if not smug, about the financial crisis, which has affected mainly the "Anglo-Saxon" systems in the US and the UK, with Sarkozy pointing a thinly disguised finger at the US. Now that the crisis is on the doorstep of the EU commission in Brussels, however, the Euros are getting first-hand experience of it, which could have some repercussions. As the contagion spreads, we can possibly expect some more high-profile activity from the commission which, so far, seems to have been keeping its head down. Are we to see commission officials in the streets with begging bowls or will they, as usual, be picking our pockets? I'm an ex-public health inspector, turned political wonk. Yet, even with my lack of military training, two years ago – when it was introduced into Afghanistan - I said it was dangerous. It would kill people, I said. It was dangerous. It did kill people. And they're now withdrawing it – because it's dangerous. Generally, it is extremely bad form to say, "I told you so!" But, in this case, I'm saying it: I told you so! See Defence of the Realm. This should be supported vigorously. It is a threat far more important than global warming. The Guardian website this morning was offering the headline, "Cameron calls for reform of banking regulations", while Conservative Home is retailing a comment attributed to Cameron that, "Gordon Brown's regulatory mechanism has comprehensively failed". More detail comes from The Press Association which has Cameron saying that there had been "failure of regulation" in the financial sector, adding that the government had been wasting time rather than reforming the system. Cameron is then directly quoted, saying: "I think that we have had a failure of regulation and we have had a debt boom that went on for far too long and it reached into parts of the economy it shouldn't have done. The whole thing has become infected and it has got to be dealt with." A propos our previous post, Cameron is playing with fire taking this line. For sure, it is generally agreed that there has indeed been a "failure of regulation", but by far the bulk of regulation, and the regulatory structures, are of EU origin. They are not within the gift of Cameron to change, without taking on the European Union, which the leader of the opposition shows no sign of doing. But to pretend that they are "Gordon Brown's" is a very silly strategy indeed. Furthermore, Cameron is wrong factually in stating that "the government had been wasting time rather than reforming the system," when the last ten years has seen a torrent of legislation dealing with the "reform" of financial services regulation, and indeed the financial services industry albeit of EU origin, or influenced by the EU. More particularly, it is particularly dangerous politically to describe the regulation as "Gordon Brown's". If Cameron and his team insist on thus defining it, the natural inference is that a Conservative government would make changes to it – would undertake the "reform", the lack of which Cameron is lamenting. Yet, for the reasons elucidated, this is not within his gift. 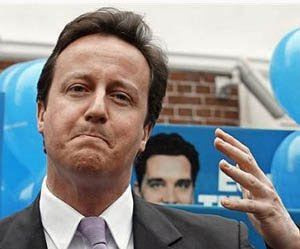 For the sake of an easy sound-bite to tide him through the conference, Cameron is giving a whole host of hostages to fortune for, if ever elected, he simply will not be able to deliver. Similarly, when Mr Osborne says that he would introduce a "Debt Responsibility Mechanism" that would require banks to put more money aside when profits are high so that they can deal with the inevitable years when profits are replaced by losses, he may not fully appreciate that his freedom of movement will be similarly circumscribed. We are told he is saying that he would give the Bank of England the power to issue official warnings to the Financial Services Authority (FSA) that banks are lending too much money too freely, a measure he says would "lead to the FSA tightening up the capital requirements on individual banks". Such matters as capital adequacy, however, are defined by the Capital Requirements Directive (CRD), comprising Directive 2006/48/EC and Directive 2006/49/EC. These implement the Basel 2 agreement and are not within the gift of any British chancellor to change unilaterally. Further, while Osborne talks glibly about raising the compensation payable to depositors in the event of a bank failure, from £35,000 to £50,000. Compensation is an issue dealt with by Directive 97/9/EC, which means this area is one of those notorious "occupied fields" about which, as we have observed previously, Osborne seems to have limited knowledge. While the Directive requires a minimum level of compensation to be paid in the event of a bank failure – originally set at €20,000 - it sets no maximum payment and specifically allows member states to "prescribe wider of higher coverage" and "gives member states the necessary latitude as regards the organization and financing of investor-compensation schemes". The Directive – and therefore the commission – is however concerned about "market disturbances" arising from the disparity of compensation paid in different member state schemes. While it specifically concluded in 1997 when the directive was promulgated that it "does not seem desirable to require any change in those schemes …", this could change. Osborne's proposal increases the disparity between schemes and, given that legislation impinges on an "occupied field", the commission could block any plans to increase the rate of compensation. In any event, Osborne would be very unwise to proceed without getting an agreement from the commission. However, with this as with all the other pronouncements, the two words completely missing from the discourse are "European Union". This accords with the general Conservative policy of not mentioning "Europe", but it will not wash. There are far too many people out there who are fully aware of the role of the EU in so many areas of our national life. The Tory head in the sand stance on "Europe" looks less and less credible by the day. More to the point, we really do not like being taken for fools. David Cameron, according to the BBC has rushed in to add his voice to sages such as Jim O'Neill, chief economist of Goldman Sachs. As he arrived at the Conservative Party conference venue in Birmingham, the BBC reported him as saying he wanted to give the Bank of England (BoE) "sweeping new powers to rescue failing banks" and would also give it "a new role of monitoring both consumer and company debt." Detailed plans are to be unveiled by shadow chancellor George Osborne on Monday. We are most recently informed that Osborne would give the Bank of England the power to issue official warnings to the current regulator, the Financial Services Authority (FSA), that banks are lending too much money too freely. This measure says Cameron, would "lead to the FSA tightening up the capital requirements on individual banks". If the BBC's report is to be taken as accurate – albeit it lacks any detail – it would appear that Cameron is suggesting something that probably cannot be done under EU rules. If he is simply suggesting – as may be the case – that the Bank and the the FSA work more closely together, then that may be permissible. Cameron's and his shadow chancellor's problem is that much of the legislation governing the conduct of the financial services industry now originates from European Union. That drastically limits their freedom of action. Furthermore, much more is in the pipeline through what is called the Financial Services Action Plan. This is part of an overall plan to complete the Single European Market in financial services, which includes integrating and harmonising the regulatory systems in each of the member states. Within that EU system, it would appear that there can be no role for the Bank of England as a regulatory authority. This is evidenced by the regulations and directives so far passed and transposed into UK law, such as the payment services directive. In each, there is a requirement for the member state to designate a "competent authority" to implement and enforce the provisions. Expressly, the EU requires of competent authorities that they shall be "either public authorities, or bodies recognised by national law or by public authorities expressly empowered for that purpose by national law, including national central banks." On the face of it, the UK government could either designate the FSA or the BoE. But that is not the case. EU law in each case goes on to require that "the competent authorities shall guarantee independence from economic bodies and avoid conflicts of interest". Here, it is argued by Eilis Ferran, of the University of Cambridge - Faculty of Law; European Corporate Governance Institute (ECGI), that the BoE as a competent authority would involve a conflict of interest. Ferran cites an example of a central bank not wanting to adjust interest rates if to do so might trigger a number of bank failures for which it could be blamed. Separating the monetary policy and regulatory roles, he writes, would remove this conflict and leave the central bank to determine to monetary policy free from extraneous influences. This particular conflict arises when a central bank is made independent and given charge of monetary policy, as was the case in 1997 when Gordon Brown – in one of his first acts as chancellor – made the BoE independent. And whether or not the conflict of interest is arguable, the government of the day took the view that a separation of powers and responsibilities was necessary. With remarkable speed, the government set in train the process from which emerged the Financial Services and Markets Act 2000 (FSMA), creating the framework which has since cemented in the FSA as the sole regulatory authority in the financial services sector. Ever since then, the government has routinely notified the EU commission that the FSA is the designated competent authority for its legislation including, for instance, Payment Services Directive and the Consumer Protection Co-operation Regulation. Returning briefly to Cameron's announcement yesterday and Osborne's intention to unveil his proposals tomorrow, it is doubtful whether, in the context of EU legislation, that increasing the monitoring powers of the BoE - as the BBC suggests - would be permitted. That might require a joint designation of the BoE and the FSA, which the EU commission would be unlikely to accept. Certainly, it is the case that any such move would have to be first cleared with the commission. 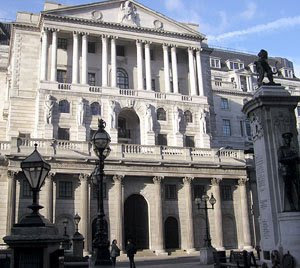 If, however, these relatively arcane issues were the only bar, it is quite possible that a robust approach to the commission could overcome the objections, in order to give the BoE a greater role. But there is a great deal more to the issue than just the points so far raised. In the first instance, the pressure for change came because the traditional regulatory structure, based on Bank of England supervision, had overseen some spectacular banking failures. After the stock market crash of 1973–4, there had been a secondary banking crisis which had forced the BoE to bail out a number of lenders. Then there had been the collapse of Johnson Matthey Bankers Ltd in 1984, followed by the British & Commonwealth Bank in 1990, the Bank of Credit and Commerce International (BCCI) failure in 1991 and then the Barings crisis in 1995. 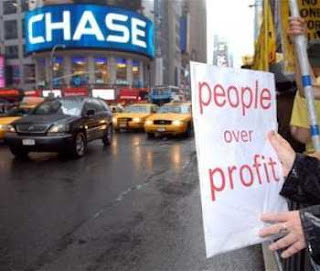 Added to that, there were regulatory failures outside the banking system, including the Maxwell affair, the notorious problem of pensions mis-selling - centred around Equitable Life - which involved the selling of inappropriate pension investment products to investors, and the Lloyds scandal. Meanwhile, there had been the (then) EEC's Banking Co-ordination Directive of 1977, the first major step towards European harmonisation in the financial services sector. From all of these influences there had developed a consensus, not just in the UK but world-wide, that a better regulatory system was needed. From this emerged the structures on which the FSA is currently based, known as the "single regulator model". This was embraced particularly by the European Union as the model for the "Europeanisation" of financial regulation. IKt was adopted by the Lamfalussy Report of 2000, to which we referred in an earlier post, and deemed the preferred structure under the Basel 2 agreement and the Capital Requirements Directive. The increasing integration of financial markets in Europe requires consistent EU implementation and convergence of supervisory practices. The importance of supervisory transparency and accountability has been stressed by the Basel Committee on Banking Supervision (caution: 251 pages, PDF) and by the Capital Requirements Directive (CRD). The CRD requires supervisors to make disclosures that allow meaningful comparisons of supervisory rules and practices across Europe. Against this background, to propose that the BoE should be more involved in supervising the banking system seems to be a throwback to a previous, failed system. On the other, it also seems to be going against the grain of decades of regulatory developments, supported and endorsed by the international banking community. 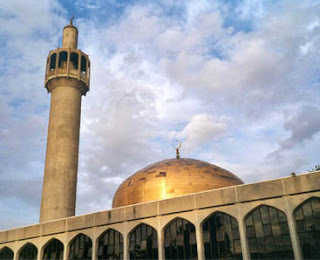 Similar structures are being adopted or considered for Japan, Korea, German and other countries. For thus either or both Cameron or Osborne to propose what could be a major change in the regulatory system would be a puzzling development. We need to see precisely what Osborne says tomorrow. The irony, though, is that the current system is not only far from perfect, the FSA is according to Eilis Ferran going to be increasingly constrained by its obligation to give effect to EU law, which will almost certainly limit its effectiveness even further. There is a trend away from the established approach of minimum harmonisation - where the minimum requirements are set at central EU level but with discretion for member states to impose stricter requirements (sometimes known as "super-equivalence") – towards maximum harmonisation – where no deviation from the rules set by the central EU authorities is permitted. Current trends suggest that national regulatory authorities of the EU member states will increasingly find their autonomy with regard to rulemaking eroded by obligations to give effect to requirements that have been set at EU level. Their role seems likely to shift from that of direct legislator to that of participant in the process whereby rules are developed at EU level. For that reason alone, we need to reconsider our regulatory structures. Unless we do, the UK authorities progressively are going to lose control as EU law encroaches, the ultimate aim being to establish a pan-European regulatory agency of which the FSA would be a branch office. Unfortunately, that does not seems to be on the agenda. But tackling this problem is far more necessary than what Cameron and Osborne seem to have in mind. So it comes to pass that the revered Jim O'Neill, chief economist of Goldman Sachs, reaches down and spews out his words of wisdom for all us lesser mortals to imbibe, offering us his recipe for resolving the financial crisis. The great Jim thus tells is, "…the tripartite mechanism for monetary and regulatory policy needs to be rebuilt. Having had a knife cut through it by the events that led up to Northern Rock, there still seem to be political ramifications from that development and no cohesion between the major UK policy players." Thus does he drivel on: "How impressive it is to see Hank Paulson and Ben Bernanke sitting together, trying to encourage US Congress to buy into their joint ideas to stop the risk of a severe recession. Wouldn't it be good to see that coming from all players here?" As always with these airheads in their sharp suits and expense account living, they simply cannot get to grips with the real world. Closeted away in their gilded ivory towers, surrounded by fawning acolytes and compliant secretaries, fêted by the dozy media which hang on their every word, they simply cannot take on board the fact that we do not have a tripartite system of regulation. Their sterile smug little brains, buoyed with their own sense of self-importance, insulating them from their own ignorance, exclude any recognition that we have a quadupartite system, the missing player being that brooding presence in Brussels that no one, but no one wants to talk about. O'Neil can twitter away all he likes about Hank Paulson and Ben Bernanke, and the idea of the "major UK policy players" coming together in like fashion, but we are no longer an independent country. Anything our "major" players come up with would have to be packaged neatly and despatched to Brussels, and thence to Luxembourg, where the EU financial ministers meet, to be chewed over by 26 other countries, only then chopped to pieces by the commission and the ECB, emerging again to be shredded by the European Council. "Perhaps giving some of the formal authority back to the Bank for regulatory matters might sharpen the minds and broaden the imagination for those involved," drivels O'Neil. But how come those "regulatory matters" were divested in the first place? Er … this we don't talk about. The current dilemmas, concludes this towering intellect: "don't need to result in a lasting negative outcome for the UK, but we need some 'out of the box' thinking, and quick." That much is true, but you won't get it from the people who presided over this mess. And Mr O'Neil is one of them, one of the progenitors of this stinking pile of ordure. Thinking, much less thinking "out of the box", clearly is not his forté. We do ourselves no favours on this blog, pointing out again and again, in as many different ways as we can devise, the simple but inescapable fact that much of our government resides not in Westminster and Whitehall, but in Brussels. There is something about the political classes and the chatterati in general that they cannot deal with this. They are in denial, determined to ignore that reality carry on as if it was "business as usual". However, that they still behave as if London is the centre of government is not a pretence. The dynamic is much more subtle than that – an absolute refusal to come to grips with the reality, acknowledgement of which would then require an acceptance that the UK government had in many policy areas become a marginal backwater of very little importance. And, if there is one thing the self-important can never come to terms with, it is that they are very unimportant indeed. Oddly enough, what is happening at what used to be central government level happened many years ago in local government, shortly after the 1973 local government reorganisation. Unappreciated by many, this reorganisation was accompanied by a major "reform" of local government management, heralded by the 1972 Baines Report, a yellowing copy of which still resides on my bookshelf. The key element of this was the creation of super-departments with chief executives who acquired a huge tranche of delegated powers, making a vast number of decisions that were hitherto reserved for councillors, to be discussed and debated in committees and full council. At a stroke, the bulk of local government shifted from political control to managerial governance. Councillors became, on many issues, largely redundant and council meetings were stripped of their meaning. The response of the councillors was interesting. Instead of dealing with the deadly dull but vitally important issues of council management, they devoted more and more time to party political bickering, with heated debates about political issues which often had no relevance at all to council business. Council meetings became theatre – hugely entertaining at first, if for no other reason than for their novelty value. Soon enough though, the novelty paled as we realised that so much of this was empty posturing. The politicians were left to bicker amongst themselves, largely ignored by the electorate who knew instinctively that their mouthings were devoid of meaning. So it is with central government politicians. The equivalent of their Baines Report was the Treaty of Rome and the subsequent treaties, which gradually stripped them of many of their powers and turned political government of the UK into managerial governance, centred on Brussels. The transition is not yet complete, as there are some policy areas which do remain as "competences" – in the modern jargon – of the London government, but most of the power has gone elsewhere. A graphic illustration of this comes with yesterday's Environment Council in Brussels, which has produced a 26-page communiqué, stuffed with detail, agreeing initiatives of enormous importance to our daily lives, many with multi-billion price tags and timetables for implementation stretching into decades. It is well worth having a look at the document, just to appreciate the vast range of issues it covers. Some of this was elaborated upon by environment commissioner, Stravros Dimas, in a speech yesterday to a conference in Brussels. Yet, despite the importance of the issues covered, such was the dullness and the lack of any personality recognisable to the British public, that the only media coverage I can find was in the official Chinese press agency Xinhuanet, and that was only a partial account. On the eve of the Conservative Party conference, the British political hacks are far too busy to care. They are preparing themselves for the theatre, analysing and dissecting the personalities and readying themselves to write yards of extruded verbal material on their speeches. If you asked them to identify the person in the photograph above, many of them would not have a clue. Yet, Stavros Dimas, as environment commissioner, is probably one of the most powerful politicians in Europe, using powers delegated to him by the Single European Act in 1984 when, with the approval of Margaret Thatcher, "environment" became an exclusive Community competence. Few though, have ever heard of him. Fewer still would recognise him. Pointing this out, of course, is "raining on the parade" – or whatever cliché you prefer to use. But it doesn't stop it being true. In effect, all next week – as with the last few weeks of the conference season – we see the politicians and hacks children at play, while the real business of government carries on without them. That fact though is so hideously uncomfortable and unpalatable that there will be no mention of it at all at the conference. 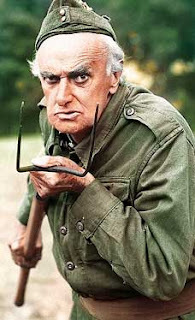 To do something so indelicate is rather like farting in church – simply not done old boy! Now that we've gone and done it, we can expect the chatterati to run a mile. Unfortunately for them, when they return, the smell will still be there. There is no escape and will be none until they accept the reality and deal with it. That is not going to be sometime soon. Zac Goldsmith, chairman and director of the Ecologist magazine – and Conservative Party candidate for Richmond Park – must be delighted with the partnership between Ecotricity and the Conservative Party. Not only is Ecotricity offering a prize to Conservative Party members of £400-worth of free electricity to the lucky winner of its competition, all entrants get a free year's subscription of the loss-making Ecologist magazine - as long as they sign up to Ecotricity (click pic to enlarge). The Ecotricity site claims this is worth £35 – although a subscription is advertised on the Ecologist site at £28. However, even at £35, Ecotricity, can well afford it. The company claims to be operating 92 wind turbines with an installed capacity of 135 MW. Allowing for a 25 percent overall load factor, that means it will deliver in the order of 385,440MWh this year, giving Vince Dale, the multi-millionaire owner of the company, a cool £17 million in ROC subsidies to play with, on top of the revenue from the electricity sales. With the Ecologist actively promoting his company, Dale will be purring at the thought of Conservative Party members being given the opportunity to read this greenie tome. On the other hand. Zac Goldsmith, who personally underwrites the cumulative losses of the magazine, will no doubt be grateful for the hidden subsidy. Possibly, the largesse on offer from Dale – who is often seen alongside Zac on the campaign trail, with both having links with Greenpeace – will help Zac offset his £72,583 donation of "office services" to the Richmond Park Conservative Association, and his £27,000-worth of "auction prizes" donated to Conservative Central Office, rumoured to be helping finance David Cameron's private office. We wonder, though, if Dale's gift to Zac will be declared to the Electoral Commission as a political donation. The Daily Mail today chooses to devote its front page to a warning by the National Grid that electricity supplies will be tight this winter, with the real possibility of power cuts. The story, in typical Mail style, is luridly written, but there is a germ of truth in what it says. Earlier this month we noted the poorly reported story of another warning by the National Grid, then remarking how tight the situation was. However, what is especially remarkable of the Mail story (online edition), is the number of comments – 243 at the time of writing. That is unusually large and can be taken as indicative of widespread public interest. After the economy, there can be no doubt that this is the most important issue in the book and, if the current economic crisis is resolved – at least temporarily – there is every reason to suppose that energy will leap to number one, especially if we do start seeing power cuts. In any event, even if the economy does go belly up, the lights going out could be the last straw. One is more than a little troubled, therefore, by the silence of the Conservative opposition. A post on Conservative Home today talks of the intended strategy of "neutralising the economy as an issue", the aim having been "to encourage voters to focus on the areas of policy where Conservatives are genuinely radical: crime, welfare, education." The policy of downplaying the economy as a political issue is, of course, no longer tenable. But neither is the apparent policy of ignoring energy. While the Conservatives may indeed want to play to what they believe to be their strengths - crime, welfare, education – energy cannot be ignored. At next week's conference, the Conservatives need to deliver a clear statement on where they stand on energy, and an outline of how they intend to keep the lights on in the UK for the next decade or so. Given the equivocation to date, where the Party seems more like a green activist group than a political party, such a statement is vitally necessary to demonstrate that it has a grip. It is already overdue. Unless they do this, the Conservatives are in very great danger of being outflanked. They ignore this issue at their peril. This blog is characterised as "right wing" and it is fair to say that our natural sympathies are with the Conservative Party. But, as readers will have gathered from our many posts, our support for the Party is conditional. We regard ourselves as "candid friends", critical when we feel the need, especially when we think that the Party is departing from its principles or taking a wrong direction. And it is doing precisely that. Sent to us is an illustration of an appallingly inept move by the Party, allying itself with the major progenitor of wind power, the company Ecotricity, which has teamed up with the Party to run a competition "where one lucky Conservative Friend or Member will win a year's worth of free electricity". This is a specific alliance with the Conservative Party, which extends an already dubious affinities programme, clearly implying an endorsement of the company. On the one hand, therefore, you have Conservative MPs fighting tooth and nail against onshore wind farms and, on the other, you have the Conservative Party getting into bed with a wind farm developer that likes to project itself as one of the leading players in wind energy. It happily proclaims itself a "partner", enjoying joint logos on promotional material, while Ecotricity is allowed to use the Conservative logo on its site. Quite how you can endorse a company like Ecotricity is infuriating. Ecotricity is in the business of installing wind turbines to make MASSIVE profits, mostly coming from the huge hidden subsidy we all pay for in our electricity bills while blighting the areas where they build the turbines. Have a look at the Save our Silton website – although it is Dorset the 6 proposed Ecotricity wind turbines will blight the landscape in our local area, including parts of Wiltshire and the Cranborne Chase & West Wiltshire Downs AONB and adversely affect the local tourism industry. Did you look into Ecotricity at all or did they just offer you that nice little carrot of free electricity for a year and you jumped at it without thinking. It is a disgrace and you should disassociate yourself from this company immediately. 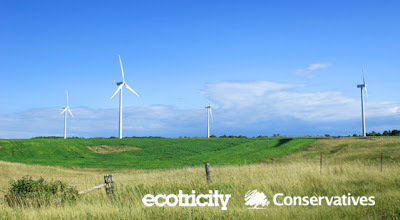 With energy policy being a key issue and wind energy a highly contentious component, the Party is totally compromised by its association with Ecotricity. At the very least, this is exceedingly poor judgement. But, with Goldsmith's behaviour on the Kingsnorth affair, one fears that it could be worse than that. However, whatever the motivation, this association is unacceptable. The Conservative Party is a political party, not a green advocacy group and it should behave like one. It would do well to heed the advice of its own members and disassociate itself from Ecotricty. We were writing about this in January 2006, lamenting the £10 billion plus costs of the EU's obsession with waste and now chickens are coming home to roost. From The Daily Telegraph and others, we learn of a report of a "hard-hitting report" by the Audit Commission which warns of council tax hikes arising from local authority failures to reduce the amount of waste going to landfill. This is because, under the EU waste framework directive, councils must reduce the amount of waste sent to landfill by half of 1995 levels by 2013 or face fines of up to £180 million per year. If these are missed, they could cost councils £7 million each per year. This would equate to around £30 per household added to the council tax. Then, on top of that, our own provincial government is adding to the grief with its own targets, which could add another £2 million a year. 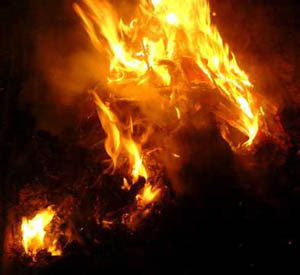 The EU legislation sets up a hierarchy of options for waste disposal, with recycling at the top, incineration next and landfill last, but the Audit Commission is saying that recycling cannot cope with the volume of waste being produced and, therefore, more use must be made of incineration. The Audit Commission states that around 30 new waste disposal plants are needed , mainly incinerators, which The Telegraph suggests "cost a minimum of £20 million". From where it got that figure, it only knows but the most recent plans for a new incinerator, in Belvedere South London was priced at £200 million. One thing the paper does get right, however, is in saying that they are "often very controversial". 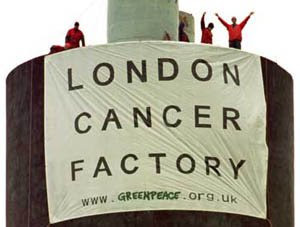 They are indeed, and hated by the greenies (pictured, right, protesting against the Edmonton site – also pictured above). Thus, you get what must be the classic quote of the day, with Michael O'Higgins, chairman of the Audit Commission, pontificating that there needed to be a "mature" debate about waste. Instead of Nimbyism, he says, people should accept the reality that incineration plants were needed. Of course, they are not needed for waste disposal. As we have pointed out so many times, there is no shortage whatsoever of landfill. This is purely to meet the impost of the EU obsession and its irrational antipathy to landfill. Needless to say, the cheapest and best way of dealing with the waste “problem” is to tell the EU what to do with its directive but, as always, there are not enough of our politicians with the courage to tell them to do that. Thus, as we descend further into madness, we end up paying through the nose and then suffering the impost of totally unnecessary and expensive incinerators that no one wants. And, for this, we are supposed to be grateful? Part of Monday was spent at a conference organized jointly by (deep breath) the Center for Security Policy with the New Criterion, Hudson Institute, City Journal – Manhattan Institute and our own Centre for Social Cohesion. With such illustrious sponsors there were illustrious speakers, including Ayaan Hirsi Ali, Mark Steyn, Daniel Johnson, Melanie Phillips, John O’Sullivan and David Pryce-Jones. Several postings will be needed to do it all justice and this is merely a preliminary musing. The theme was “Free Speech, Jihad and the Future of Western Civilization” with a sub-heading mentioning libel tourism, a peculiarly British problem but that was not one of the main subjects. Since there were no lawyers on either of the panels, there could be no discussion of how the libel laws of this country can be changed as, we all agree, they must be.A repeated theme elaborated by several speakers was the notion that the danger we are facing through soft jihad is greater than any we have faced before as neither Nazism nor Communism were so obviously ensconced in our society. There were no schools named after Lenin or St Adolph churches on street corners. Thus, our refusal to fight the jihad is liable to destroy Western civilization in a way the other two ideologies could not. Let me, respectfully, disagree with that. Well, I guess you expected that. The long analysis and disagreement is on EUReferendum2, though without pictures as I cannot think of any appropriate ones. The purchase by EDF – 85 percent owned by the French state – of the assets of British Energy for the sum of £12.5 billion is, on the face of it, both worrying and reassuring. On the one hand, it puts a sizeable proportion of the British nuclear industry in the hands of a foreign – and some would say hostile – power. On the other, it is the only sure means of kick-starting our nuclear programme and replacing some of our ageing nuclear reactors. EDF is saying that it will now commit to building four new reactors on two sites, Sizewell in Suffolk and Hinkley Point in Somerset. 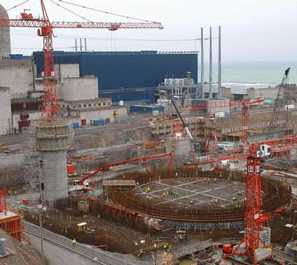 The model will be the 1650 MW European Pressurised Reactor (EPR), the first of which type is already under construction in Flamanville on the Cherbourg peninsular (pictured), at a cost of about £1.4 billion. At a cost roughly of £1 million per MW deliverable capacity (assuming a load factor of 90 percent) this compares favourably with the cost of wind which comes out at roughly £4 million for onshore sites and double that or more for offshore. As such, the investment in nuclear represent good value for the customer, wind only surviving with a massive subsidy. These new power stations alone will nearly compensate (on paper) for the loss of six nuclear plants which are due to go out of service in the next ten years, the former expected to produce 6.6 GW as against the nearly 7 GW capacity of the six, although since some of the old stations are producing at relatively low load factors, EDF's contribution is set to add real capacity to the network. On top of that, there stands EDF's proposal to hand back two of the British Energy sites to the government which will be packaged with other non-operational nuclear sites, for auction to other bidders. By this means, the hope is that we will gain another nuclear player which will add still further capacity. The downside of this is that the first of the EDF plants will not be commissioned until 2017 – if all goes well – and will not deliver power to the network until 2020. The second player can hardly expected to bring capacity online any earlier, which means we are looking at a sizeable gap in capacity, expected to kick in from 2012 or even earlier. How big that gap will be will depend on the fate of any replacement programme for the six coal-fired stations which are shortly to be knocked out by the EU's Large Combustion Plants directive, these accounting for a further 8.5 MW loss. Only one new coal-fired station is currently scheduled to replace the loss, at the controversial Kingsnorth site, but the fate of this remains in the balance by the intervention today of Lord Smith, chairman of the Environment Agency. Smith is saying that construction of coal-fired power stations should be banned until or unless they can be equipped with carbon capture and storage (CCS). Currently an unproven technology, this will double (or more) construction and electricity generating costs and add considerably to the coal burn. With CCS, the feasibility of continued coal-fired generation is very much in doubt. This, of course, leaves the prohibitively expensive wind programme - the unreliability of which means that it cannot even begin to fill the energy gap – and the "dash for gas", with generators commissioning CCGT (Combined Cycle Gas Turbine) plants such as the new 1650 MW power station at Staythorpe near Newark. At about £4-500,000 per MW of deliverable capacity, these are considerably cheaper to build than nuclear plants – and massively cheaper than wind. They are thus an attractive "quick fix" for generators wishing to get new capacity online. However, the cost of gas and the uncertainty of future supply makes them a poor bet for the consumer, who will be faced with spiralling costs and the risks of outages if supplies become unavailable. Even then, the CCGT programme is unlikely to make up for the expected shortfall and since, at this time, the only known nuclear programme will deliver just slightly more power than the stations scheduled for closure – and then only some years after they have ceased generating, it is difficult to see how the network is going to deliver the UK's electricity needs over the next ten years or more. Now that is something we could have a "mature debate" about. It really is a bit of a nerve for a newspaper which devotes its front page lead to a story proclaiming that "pregnant women to be offered flu jabs to protect babies" then to complain in its leader about the silence of the political classes on the financial crisis. Under the title, "Britain must speak up at the trial of capitalism," it suggests baldly: "But isn't it time it [the government] at least launched a mature debate on this epoch-defining crisis? ", having first cast an admiring look at the US where congress is locked in debate over the Paulson rescue package. This is "in glaring contrast to this country," it notes, "where there has been no recall of Parliament and the political classes appear tongue-tied". Nevertheless, this is the same newspaper which consigns comment on the impending "energy crunch" and the sale of British Energy to EDF to the business section, with a remarkably illiterate piece by Damian Reece, which does not suggest that the newspaper begins to understand what is going on (we'll write more on this later). Funnily enough, the phrase "mature debate" appears elsewhere in the Telegraph, this time in a story about EU fines for missing "landfill targets". 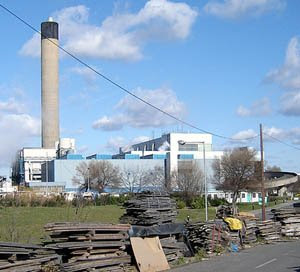 There, in the context of meeting an EU requirement to cease using landfill, we see Michael O'Higgins, chairman of the Audit Commission, declaring that there needed to be a "mature debate" about waste, and that instead of Nimbyism people should accept the reality that incineration plants were needed. There has, of course, never been a "mature debate" on waste – the issue was decided long ago at EU level and now our task is to roll over and build a vast network of extremely expensive incinerators to meet EU requirements. That is what O'Higgins means by the phrase. Something we will not get, of course, is a "mature debate" on our previous story as that too has been decided for us, which means that any such debate will simply be - pace incinerators – how we go about complying with our masters' demands. Therein lies our problem and confusion. Yes, we do indeed need a "mature debate" on all sorts of issues, not only in parliament but in the media – and also on the so-called political blogs. But does anyone know what the term means anymore? And when the power has been drained from our politicians to the extent that even if they discuss matters they cannot do anything about them, what is the point anyway? Daytime Running Lights are back on the agenda. No one particularly wants them. The British government was opposed to them, the cyclist and motorcycle groups are emphatically against them. Furthermore, the safety benefits are equivocal. Until LED lights are perfected, they will increase fuel consumption and they will add cost and complexity to vehicle construction. 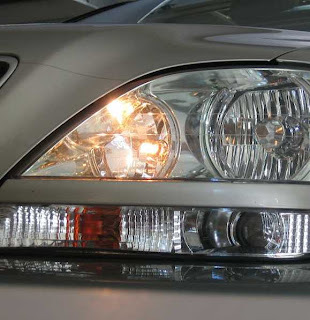 But never mind all that, in a bland statement yesterday, we were told that, "the European Commission has decided to introduce dedicated Daytime Running Light (DRL) on all new types of motor vehicles from the year 2011 onwards." So that's it, then. The European Commission has decided, so we're going to have them. Actually, although the announcement was yesterday, it was a done deal in November 2007. Then, as we are now informed, the Commission delivered a positive vote in the World Forum for the Harmonization of Vehicle Regulations of the United Nations Economic Commission for Europe (UN/ECE) regarding DRL. This is reflected in the draft directive and the Commission has declared that, "In order to avoid divergent vehicle requirements, which would be detrimental to the needs of European citizens and the European industry, today's decision is technically a proposal to align Directive 76/756/EEC with UN/ECE Regulation No 48." We dealt with this, and the involvement of that shadowy body, UNECE, in a previous post and again a few weeks later. Essentially, technical regulations are being made out of sight with no audit trail and no democratic accountability whatsoever. And when they emerge into the daylight, they come – as in this case – "as a proposal to align Directive 76/756/EEC with UN/ECE Regulation No 48". We cannot refuse to accept this as the deal was made those many months ago and we cannot possibly have "divergent vehicle requirements". What is particularly disturbing, however, is that UNECE is technically an intergovernmental body, at which its member states (including the UK) are represented, each of whom have a vote. But here, it seems, the "Community" cast a – or even the – vote. Since when has the EU been represented on UN bodies and been able to cast votes? As of now, The Daily Mail is hyperventilating about the proposal. "Drivers face paying up to £160 a year more for fuel," it screams, and all, "because of an EU directive forcing them to keep their headlamps on all day.". As always, it misses the point completely. The proposal concerns specially fitted lights, not headlamps and, by the time the law comes into force, they will mostly be LED fittings. Energy consumption is only about ten percent of a normal light. Conservative MP Greg Knight is saying that: "This idea was being pushed by Scandinavian countries and it's absolutely ludicrous that it should be imposed in a blanket fashion across Europe." Stephen Ladyman - a transport minister during earlier discussions and now a backbencher - said: "This directive will kill a lot of motorcyclists. They use daytime lights to make them easier to see but if cars are using them as well, motorbikes will blur into the background." In the EU parliament, Conservative transport spokesman, Timothy Kirkhope, is objecting to the lights, also on safety grounds, and is calling independent assessment of the benefits "before any EU legislation on vehicle running lights was approved." But all these worthy "lawmakers" are too late. They do not seem to understand that, because the agreement has been made at UNECE level, the EU is obliged to "normalise" its own laws by implementing the regulation. Their job is to rubber-stamp the agreement, move on and collect their salaries and expenses. We expect no less of them. Ambiguity – or the truth revealed?